~ First Time Home Buyer Tax Credit of $8,ooo available 1/1/09 to 12/1/09 to reduce tax liability. This one doesn’t need to be repaid. If the full credit isn’t used the unused balance will be refunded. New Construction Buyers, Move Up Buyers and Municipalities? There are real estate markets impacted by recent events where the majority of real estate transactions are “move up buyers” and “new construction buyers”. The First Time Home buyer range may be well under $300,000. Local governments are depending on property transfer tax to fund community services. In the best of all possible worlds, those of us who work with buyers might have designed the “ideal” program differently, to be one that benefited ALL buyers and stimulated new construction as the National Association of Realtors recommended. Move up buyers and new construction buyers also stimulate jobs AND the sale of thousands of homes, washers, dryers and other appliances. Including ALL buyers in a credit could have only been a plus to the recovery. 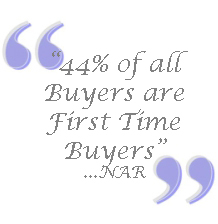 I’m very happy for all First Time Home Buyers. Fancy convoluted credits to be repaid? I’m glad they’re gone from this version. But 56% of all home buyers will not receive a credit from this stimulus package. But what do I know. I’m not an expert. * Does it meet the need? I don’t know. Maybe. I hope so. I really do. Guess, we’ll know soon enough. Maybe there will be a sequel, you know like in the movies, Raiders of The Lost Housing Market Ark. I like Harrison Ford. Sorry, I try to watch my non sequiturs, but that one sneaked in. *No comments in this article are intended as legal or accounting advice. Consult your attorney and accountant for all tax advice. This entry was posted on Monday, February 16th, 2009 at 7:33 am	and is filed under Financial, First Time Home Buyers, Home Buyers, Market Trends. You can follow any responses to this entry through the RSS 2.0 feed. You can leave a response, or trackback from your own site.